LED track light head is simply the best track light upgrade available. 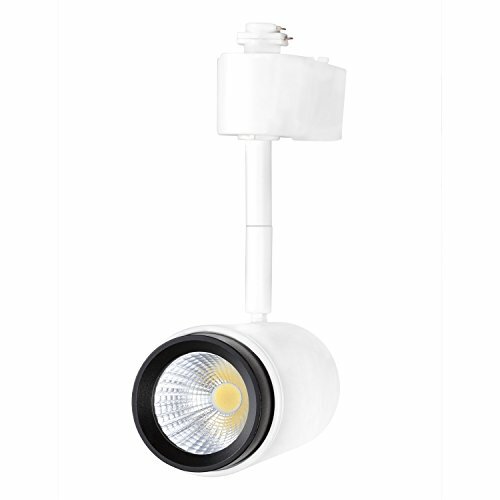 By using this integrated track light, you get a fully dimmable light that dims smoothly from full power down to 5%, a strong 800 lumens of beautiful high quality illumination at a perfect 3000K Warm White color. Takes the ambiguity out of matching LED bulbs to halogen fixtures that often flicker or burn out due to incompatibilities between transformers and dimmer switches. Simply remove existing track head and replace with this fully complete assembly. This LED 3 Wire track head is an energy-saving design that features both an adjustable head and swiveling arm. This energy-efficient LED track head is crafted from aluminum and comes in a sleek white/Black finish. It features an adjustable head and swiveling arm that allow for 350 degree rotation and a 90 degree pivot. If you have any questions about this product by Light Blue USA, contact us by completing and submitting the form below. If you are looking for a specif part number, please include it with your message.